Students in Digital Technology and Culture create pieces in a wide variety of digital formats including (but not limited to): graphic design, web design, information design, video, animation, and games. Many of our classes also work with community clients and partners so students get a chance to practice their skills in a service-oriented environment. Explore some of the recent exemplary student work below. In this multi-part group project students evaluated an established website for a community-based client and redesigned it to meet the client’s expectations while maximizing the site’s usability and interface design for their client’s user base. The students worked largely independently to create the website after their community partner suffered a family emergency at the start of the semester. 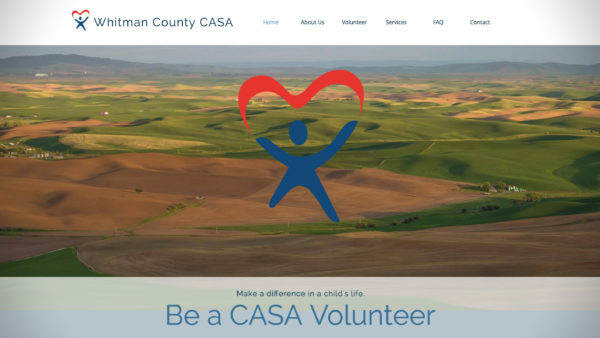 They researched what CASA is and what they do and created a website that ended up thrilling the client. 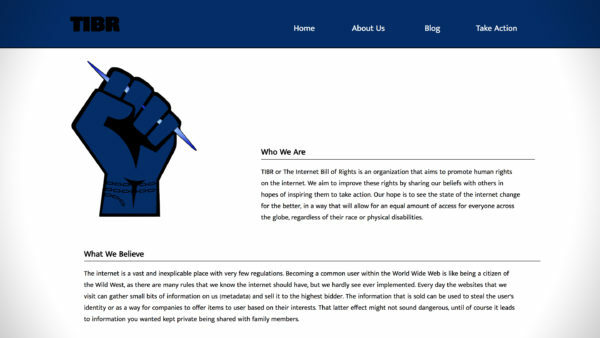 Rocky’s project capably and seamlessly drew together advanced technologies to support his goal of promoting an “Internet Bill of Rights” and promoting that globally-oriented Bill of Rights to tech-related organizations in the Pacific Northwest. He did considerable research on similar initiatives in the past to identify and anchor his own position, identified a need on his part to follow a digital project development and communication process that he could transfer to other contexts after graduation, and identified the particular sorts of technologies that would both be useful for the project and push him to extend his knowledge beyond his current comfort zone. His work integrated themes he researched with development and project management techniques he learned in more production-oriented classes. Best Interactive Design & Technology work at the 2018 DTC Awards. In the final project for DTC 478: Usability & interface Design students are broken into small groups and work with a community partner to test and redesign their website. The final step in this project is to create deliverables – documentation on their process – to their clients. 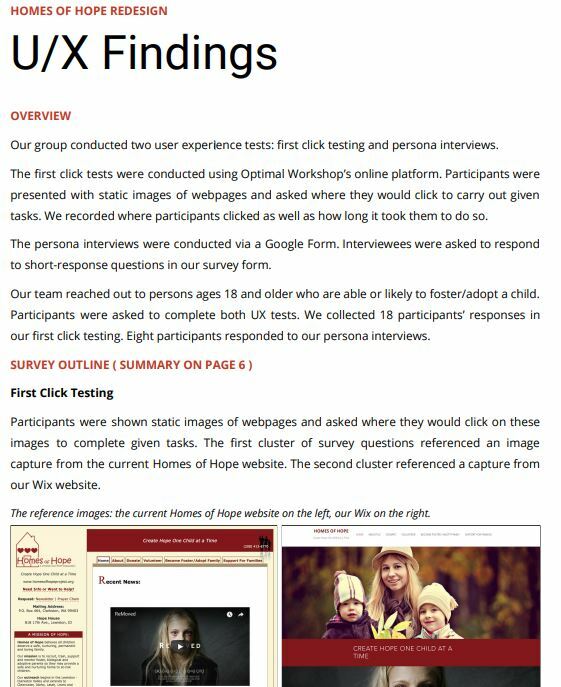 The Hopes of Hope website redesign group created beautiful, easy-to-follow documentation for their client. Pictured here is a snippet from one of the pages. This group won the Information Systems & Structures Award at the 2018 DTC Showcase. 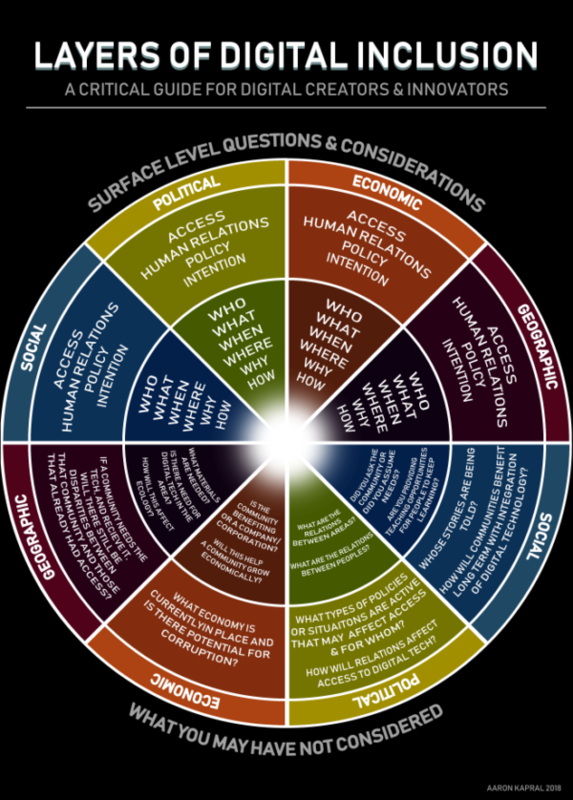 This reflection assignment asked students to bring together the major topics in the course. Aache won the award for Inclusivity & Diversity at the 2018 DTC Showcase for her work on this project. This animation piece was inspired by the 2017-2018 common reading book at WSU, “Ready Player One.” The book is highly nostalgic of 1980s culture. However, Evie Caldwell, wanted to simply comment on the lack of female heroines in video games of that era. This short animation piece was created over the course of a semester using Adobe Photoshop, Illustrator, and After Effects. In DTC 475 students were assigned to complete a Critical Let’s Play of a particular video game. Let’s Plays are generally discussions of game mechanics, playability, and artistry by a critic that are done as the player works through all or a portion of the game. In this class the students were asked to focus on critical aspects of gender, race, and/or sexuality in the game. Aboluo took a feminist route and analyzed why the characters might want to smash the world as he played the game. All of the students in DTC 491: Advanced Digital Cinema decided to collaborate on one project for the 2018 50 Hour Slam, a timed filmmaking competition out of Spokane where teams have just 50 hours to make a film from start to finish. Their final product was a short called “Out” that explores issues of sexuality and agoraphobia. This group won the 2018 award for outstanding Digital Cinema, Animation, and Sound piece at the DTC Showcase. For the final assignment in the spring 2018 version of Digital Diversity, students were placed into small groups and asked to create a game that addressed an intersectional issue. 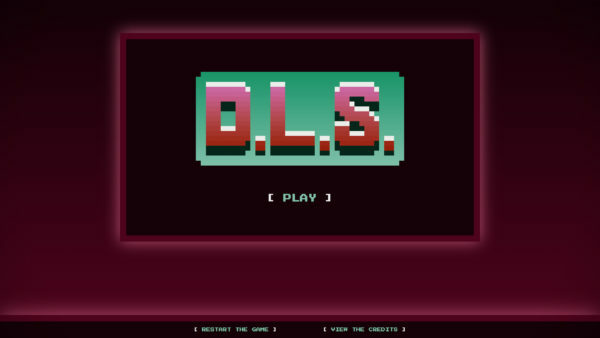 D.L.S. was praised for its sleek design and the ending that contained an impactful twist. 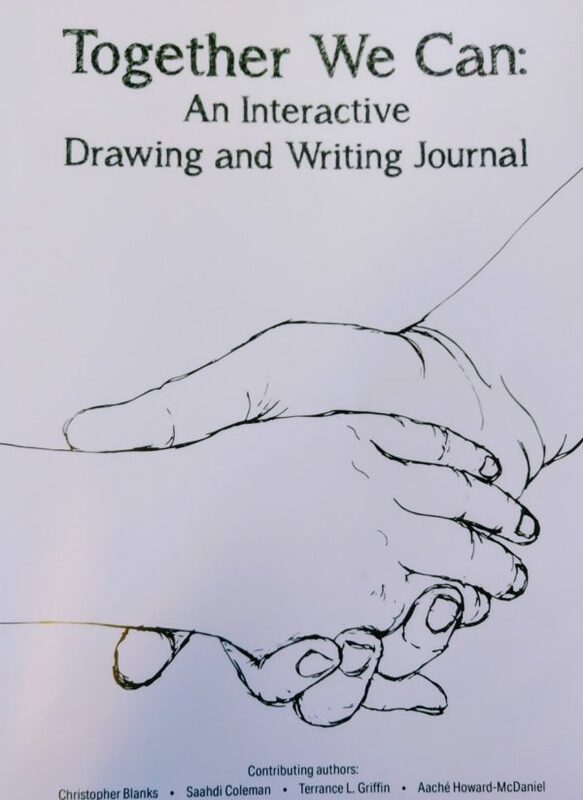 This group designed the game based on the ability-focused “Spoon Theory” from a 2003 short essay by Christine Miserandino. “Spoon Theory” was an attempt by Miserandino to articulate how a person conserves and expends energy throughout the day and how different disabilities impact a person’s “spoons.” “Invisible Disability” was a visualization of how a low-income female college student with a mental disability may have unique challenges based on her intersectional identity.